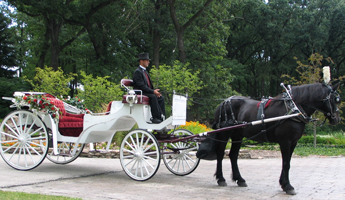 Jim & Becky's Horse & Carriage Service in Peotone, Illinois, understand that details make a difference with horse carriage services. We keep our carriages and trucking equipment in top condition. All of our horses receive loving respectful care. We also strive to provide prompt and courteous service from the initial inquiry to a relaxing carriage experience on your big day. Clients appreciate that the images seen here reflect exactly what you can expect for your occasion. All of our services are competitively priced, and we respond to inquiries within 24 hours or less. Once your date is scheduled, we will contact you via phone the Tuesday or Wednesday before your event to confirm all the final details. We'll show up on time and are usually ready and waiting earlier than scheduled. We also work well with photographers and videographers to assist in posing the horse and carriage for stunning portraits. People also admire that we give the utmost attention to the care of our horses and equipment. Our horses have access to acres of green pastures, have clean paddocks, and are housed in comfy, oversized stalls. Our carriages are kept in climate-controlled buildings, and we transport them to locations in enclosed trailers. Our horses are meticulously groomed and our carriages thoroughly cleaned before we arrive at your event. And your coachmen will be properly attired for your occasion to add the finishing touch. Come see for yourself how the horses and carriages are cared for at our establishment in Peotone. Once you see how extensive our professional operation is, we believe you'll feel confident about booking our services. Please note that visits are by appointment only, so schedule your time today.